Introducing MLP...an exclusive treatment combining our hard chrome plating with a proprietary polymer compound. The addition of a polymer compound heated until it flows into the cavities or "pores" in the nodular surface adds built-in lubrication. This is further enhanced by polishing the surface while the polymer is still fluid, resulting in a smoother, slippery finish that substantially reduces the heat and friction problems created in many applications. Unlike many other industrial plating's MLP hard chrome will not separate from the base metal. In addition, with a processing temperature of 195°F there will not be any affects on the tensile strength of your tooling or parts. MLP hard chrome has many of the physical properties of our Hard Chrome plating but with the impregnation of our proprietary polymer compound. 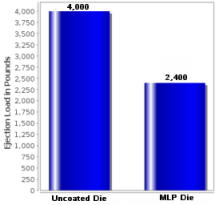 MLP is a relatively low temperature plating. The hard chrome is applied at 140° F. The Polymer is applied at 185° F. The base metal remains unchanged by the surface coating at these temperatures, therefore the desired properties of the substrate material are intact beneath the plating. Inside diameters from .250” and larger can be coated in most cases. Consistent minimal thickness requires no design changes. MLP Hard Chrome plating has proved to be a viable coating for industrial tooling for nearly two decades. The graph to the left represents test results performed by Concurrent Technologies Corp. These tests measured the difference in ejection loads under identical conditions. Various types of materials with a variety of lubricant % were compacted to compare the difference between an uncoated die vs. an MLP coated die. The left side of the chart represents ejection loads in lbs. 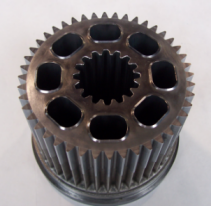 The MLP Hard Chrome plated die required approximately 43% less ejection load without lubricant. Is MLP Hard Chrome Plating Expensive? There are several factors that are used to determine the cost of our MLP plating. Typically the cost of coating most tools is usually less than 10% of the total cost of making it. Powder Metal tooling parts, all ferrous and non-ferrous metals that are commonly machine wrought or cast and steel, brass, copper, etc. can be processed. Click here to read an article published in "Machine Design" magazine featuring our MLP Hard Chrome plating on metal tooling. Click here to read an article published in "Machine Design" magazine featuring our MLP Hard Chrome plating on plastic injection molds. Why coat with our MLP Hard Chrome?